Buying, selling, and making a profit. Merchants know the secrets of the coin, and how to turn a single coin into a vast fortune. 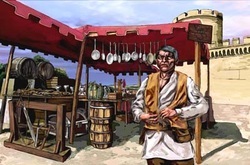 Many Merchants make their fortunes by traveling lands and selling their wares. Others prefer to settle down in well populated areas, opening stores that people visit and selling their wares that way. Merchants have the unique ability to smooth talk toher merchants into giving better deals, making partnering or allying with a merchant often saves a great deal of money.